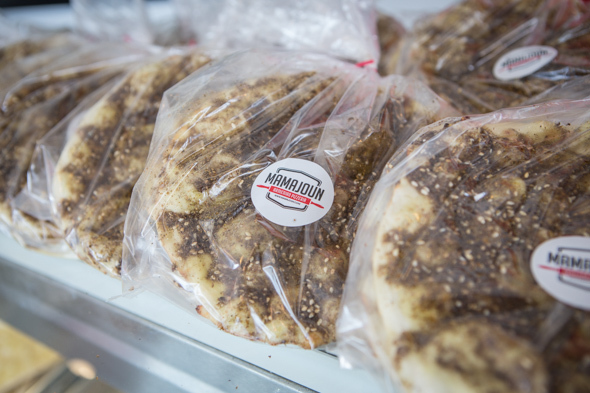 Mamajoun dubs itself as an Armenian pizzeria, but more accurately, the months-old takeout counter specializes in lahmajoun, a flat bread traditionally topped with a mix of minced meat and red pepper paste. Co-owners and spouses Mihran and Natasha have created a very contemporary-looking spot. It's a brightly lit white room punctuated with pops of red, "inspired by our honeymoon in Paris. We loved the red doors," Mihran says. 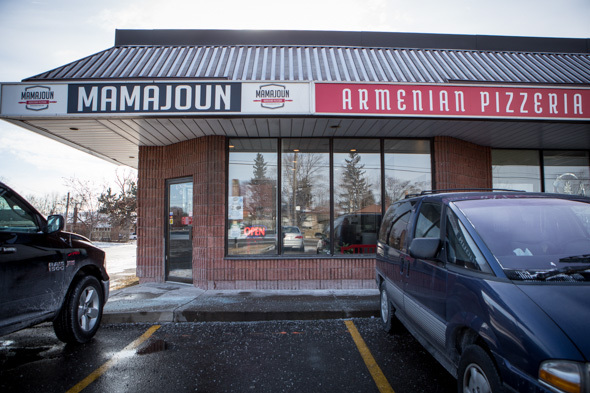 I could see a place like this thriving downtown, but this eatery is occupies a unit in a Scarborough strip mall. 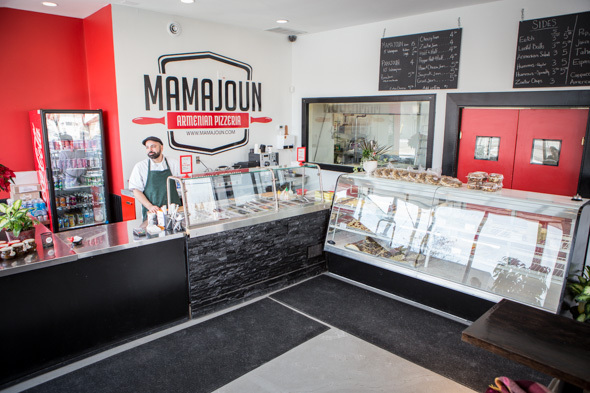 The concept feels unique, though Mihran adds that lahmajoun shops are common in Montreal (where he grew up), and his motivation to open this place came about because of the constant requests from friends and family to bring stacks of flatbreads to Toronto each time he visited. Growing up, his mother would prepare minced meat, and then bring it to the local bakery where they'd use the homemade mix to make her order. The same recipe is in use here -- the name Mamajoun is a tribute. 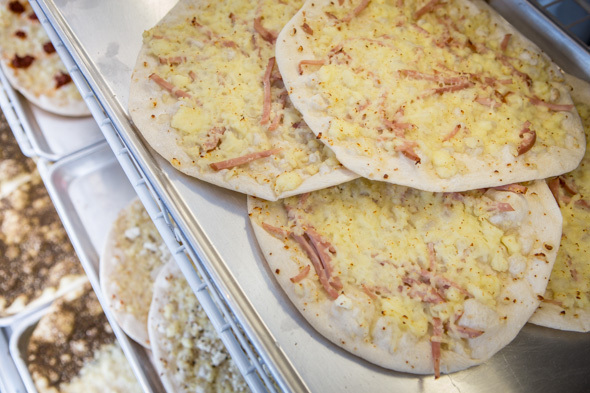 The pizzeria does indeed make pizzas atop lahmajoun, but the flatbreads traditionally don't need the extras. These sell by the dozen for $15, or one at a time for $2.50, while a pastry case displays other variations dusted with za'taar ($4.50), Akawi cheese ($4.50), red pepper paste ($4.50) or Armenian soujouk sausage ($5.50). 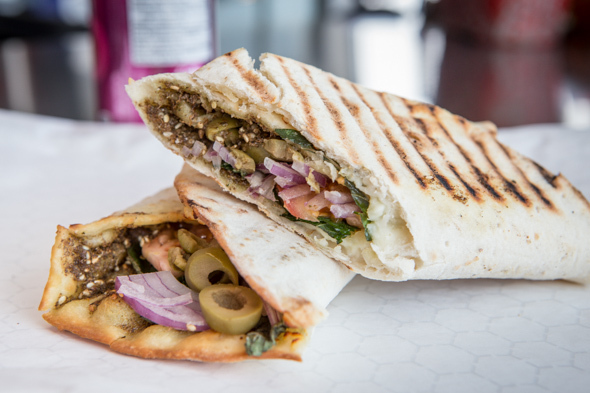 Included in the price is the option to turn the flat bread into a sandwich topped with fresh ingredients. You can have a ham and cheese 'joun ($5.50) folded around fresh mint, tomatoes and onions, or on weekends, find the soujouk breakfast-ized with the addition of scrambled eggs ($6.50). 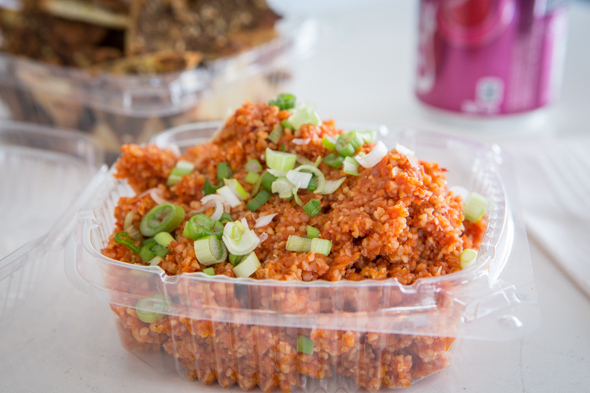 Aside from baked goods, there's Eech ($5), a lemony bulgur salad stained with red pepper paste and flecked with tomatoes and onions. 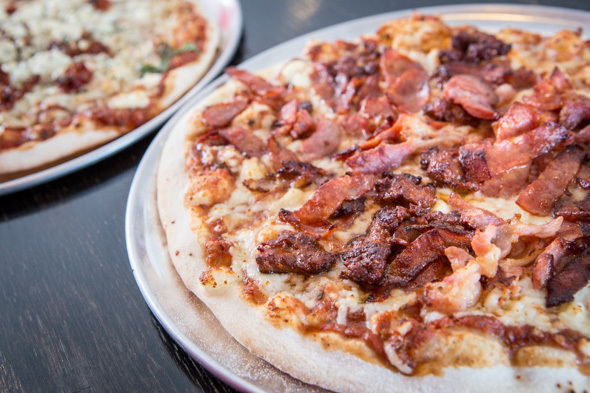 The pizzas are a fusion of tradition with an irreverent dash of pop culture. 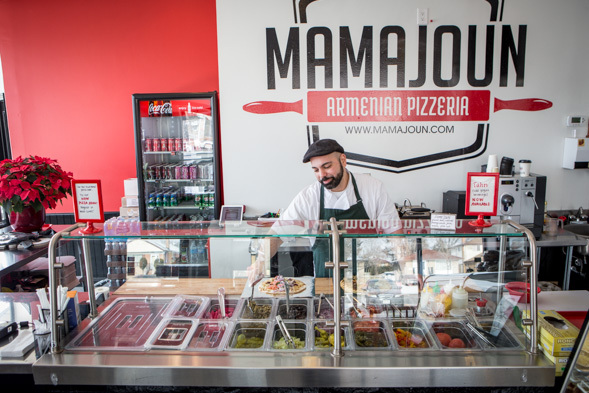 There's a meat lovers version ($8.50), loaded with bacon strips, pepperoni and soujouk, as well as a goat cheese, mint and sun-dried tomato pie ($9.50). Overall I can tell that everything is made with a lot of care and pride, and the price points make everything on the menu seem extra appealing. Fingers crossed this is a cuisine that catches on -- I'd be regular if only there was a location downtown.